SALISBURY—Britain’s interior minister on Friday March 9 visited the scene where a Russian double agent was found unconscious on a bench outside a shopping center after being poisoned in a nerve agent attack. Former double agent Sergei Skripal, 66, and his daughter Yulia, 33, have been in hospital since they were found unconscious on Sunday on a bench in the southern English cathedral city of Salisbury. 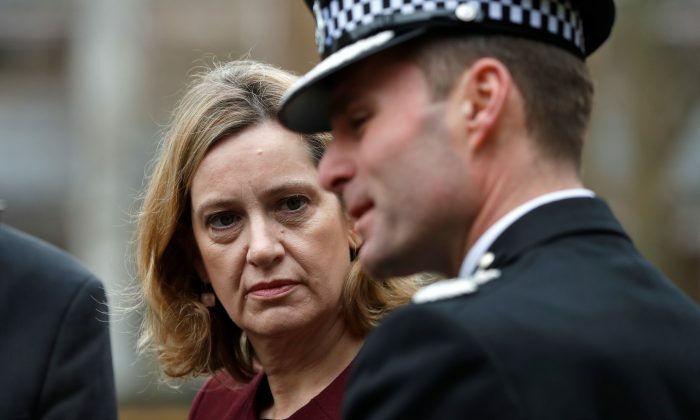 Home Secretary Amber Rudd visited the city on Friday, including the area around the bench—now covered by a police forensics tent—where Skripal was found, according to a Reuters photographer at the scene. Britain has said it will respond appropriately if evidence shows Moscow was behind the nerve agent attack. The Kremlin has denied any involvement in the incident and says anti-Russian hysteria is being whipped up by the British media. British experts have identified the substance, which will help identify the source, but the police have not made the information public. Both victims remain unconscious, in a critical but stable condition, while police officer Detective Sergeant Nick Bailey, who was also harmed by the substance, remains in a serious condition though he can now speak. A total of 21 people had been treated in hospital following the incident, police said. The attack has been likened in Britain to the assassination of ex-KGB agent Alexander Litvinenko, a critic of Russian President Vladimir Putin, who died in London in 2006 after drinking green tea laced with radioactive polonium-210. A British public inquiry said Litvinenko’s murder had probably been approved by Putin and carried out by two Russians, Dmitry Kovtun and Andrei Lugovoy. Lugovoy is an ex-KGB bodyguard who later became a member of parliament. Both denied responsibility and Russia has refused to extradite them. Russia’s embassy in London declined immediate comment.